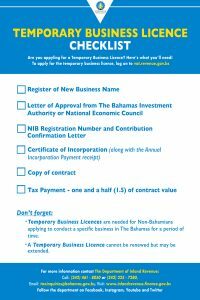 Temporary business is a business undertaking in respect of the execution of a specific contract for a specified period not exceeding three years by foreign contractors. Ensure the online Business Registration Application form indicates that it is a Temporary Licence. Approval from The Bahamas Investment Authority or the Ministry of Finance. Once all requirements are met and approved, the application is then processed within 7 working days. The Department of Inland Revenue will contact the applicant via the online user account for additional information or clarification if needed. You should regularly check your messages in your online account and the email address you provided for correspondence from the Department.